Dr. M.S. Bhagavathi is a young enthusiastic physician engaged in the activities of AKP Homoeopathic Clinical Research Centre. She has been graduated from Sarada Krishna Homoeopathy Medical College, Kulasekharam, Tamil Nadu. Here she present a case of allergic dermatitis. 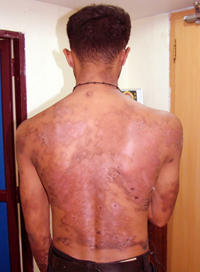 A boy aged 23 years presented scaling and peeling of the skin since one month. Initially he had fever, for which he taken some antibiotics. Suddenly started itching rashes and hot flushes all over the body and later suffered with breathlessness and he faint. He was admitted for the anaphylactic shock afterward the lesions became very exfoliative. Finally he discharged and warned him to take the drugs carefully. He opted homoeopathic treatment since it is free from side effects. The lesions are scaling, itching < night. Some lesions were dark pigmented. A simple prescription based on symptom similarity and miasmatic expressions Sulphur is prescribed here. Low potency is preferred owing to the susceptibility of the patient and repetition also done on that basis.